Homecoming once again as all four are in the studio and without that pesky delay on the phone! They make up for lost talk time! There is plenty of catching up conversations on who’s been where and who did what. Erin is also in studio, so you get to hear a little about her trip to Washington DC, of course Al tells us all about NYC, Niagara Falls & The Finger Lakes (something that sounds dirty but isn’t). Buddy gives an update not only on sports, but a little about the drive-thru experience from Carl’s JR. As usual, Clayton’s weekly update involves a vacuum and a flood, but listen anyway. Marnie really is just happy that Erin is home, but she throws in the “C” word about a dozen times and not only about Brewer! I think the drinking is slowing down on these shows…we need to ramp it up kids! 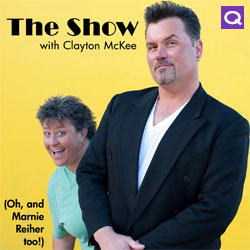 This entry was posted in QTalk America (Explicit), The Show with Clayton McKee by Clayton. Bookmark the permalink.